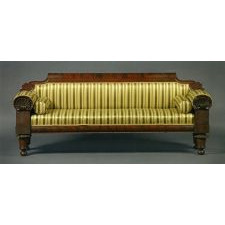 The scrolled crest terminating at each end with cyma curves and anthemion carving, above an upholstered back, and seat flanked by arms with carved scallop shells, above plinths connected by a bolection-molded and gadrooned seat rail, raised on stout lotus carved and turned conical legs, with ball feet. The back board bearing the ink stencil: COOK & PARKIN/ CABINET WARE/ PHILADELPHIA. H: 35" W: 89" D: 24½"
Condition: Excellent. 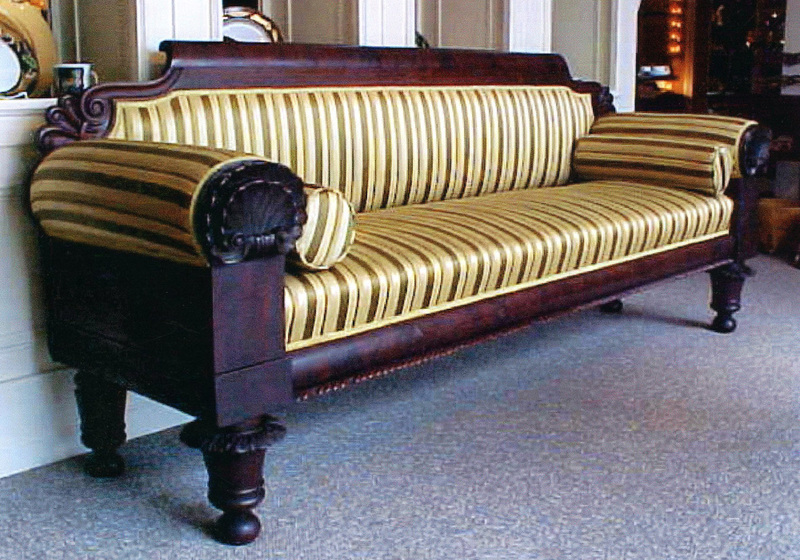 Small loss to carving on the proper-left shell, retaining antique surface, modern upholstery. Allison and Jonathan Boor, Philadelphia Empire Furniture (West Chester, PA., Boor Management, 2006), 378. Carswell Rush Berlin "'A Shadow of a Magnitude': The Furniture of Thomas Cook and Richard Parkin," American Furniture, edited by Luke Beckerdite (Hanover, N.H.: University Press of New England, 2013), 175. 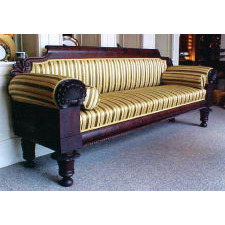 The form of this sofa is typical of Philadelphia box sofas of this period and there are at least four related labeled examples by other Philadelphia cabinetmakers including Joseph Barry, Charles & John White, David Fleetwood and H.B. (William) Grubb. Measurements H: 35" W: 89" D: 24.5"